Little Red Pocket Cocktail Bar is a gem hidden away on 422 Little Collins Street. 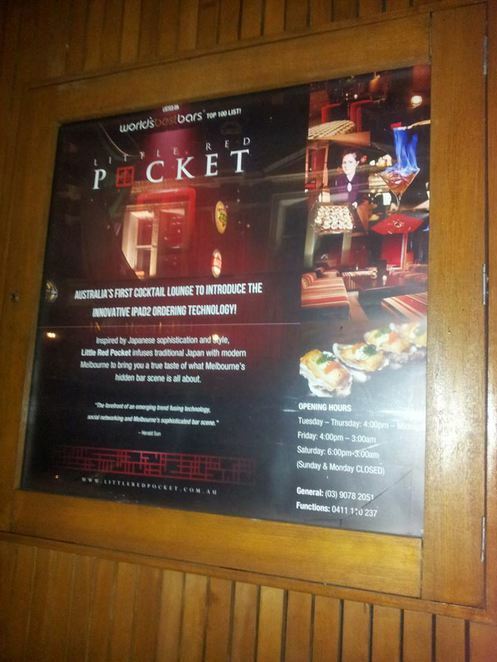 Voted no 8 in the World's Best Bars Top 100 List, Little Red Pocket is indubitably one of the best bars in Melbourne. 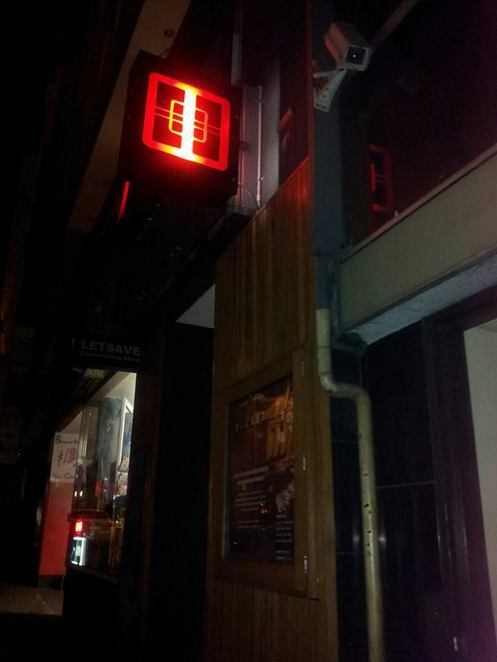 On a cold Friday night, I was invited to grace the red carpet of the Little Red Pocket Cocktail bar. As I climbed up two flights of stairs and entered the bar, I was greeted by the smiling manager Elizabeth (Lizzie). Lizzie explained that the bar was inaugurated 3 years ago and continues to thrive in the hustle and bustle of Melbourne laneways. After some chitchat, Lizzie handed me the menu and guided me through the extensive range of cocktails, sake, food and other offerings. Little Red Pocket serves an exquisite range of drinks. From wine to cider, from sake to cocktails, the options are endless. 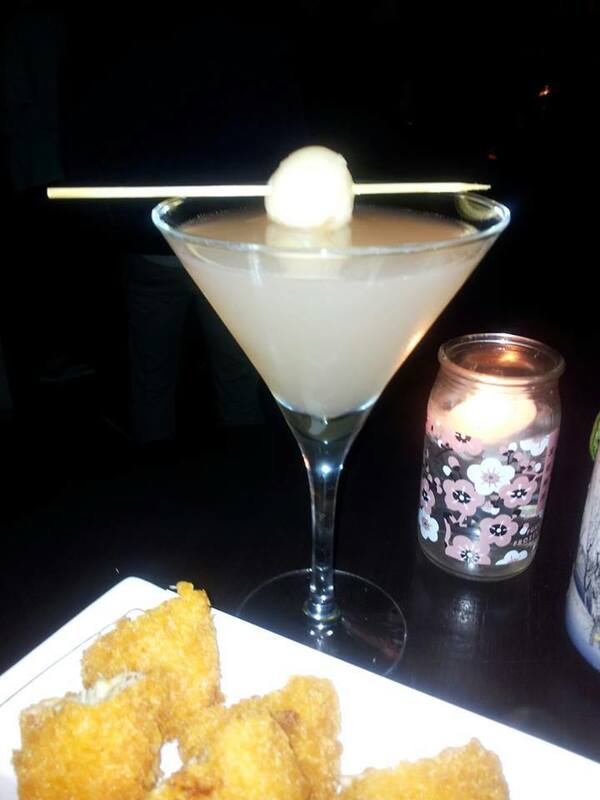 Arrested with indecision, I sought Lizzie's assistance and finally settled on a Lychee Long Time and a Mr Miyagi. Mr Miyagi is a concoction of Yamaki 12 year old Japanese whisky, raspberry puree, Framboise, cranberry juice and finished off with a slice of lemon, served tall over crushed ice. This delectable cocktail had me at hello. 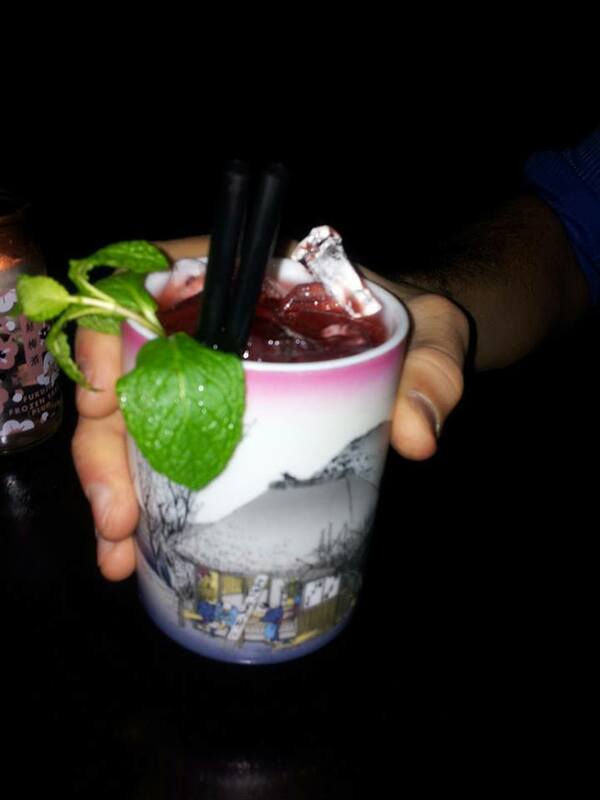 Slightly sweet and quite potent, this is a gentleman's drink but will also appeal to the ladies. I am not a whisky drinker but the impeccable balance of whisky and the cranberry juice makes this drink a remarkable cocktail. Savour this cocktail bit by bit as you revel in the lip-smacking flavours. The Lychee Long Time is conjured up by combining exotic lychee, freshly pressed cloudy apple juice, aromatic Junmai sake and a hint of rose. The drink is served with a succulent lychee on top. As your tongue will struggle to differentiate between the exotic flavours, experience a feeling of rejuvenation flooding your senses with every sip of the drink. The presence of the sake in the cocktail enhances the flavour by manifold. Cool, refreshing and a delight to the tastebuds, this cocktail is one of the best cocktails I have sampled so far. Ordering food from the drool-worthy menu was nothing short of a struggle. The Izakaya inspired menu boasts a wide array of food which will appeal to anyone, even the ones with an indecisive streak. After much dilemma we finally cast our votes for 4 exquisite items on the menu. 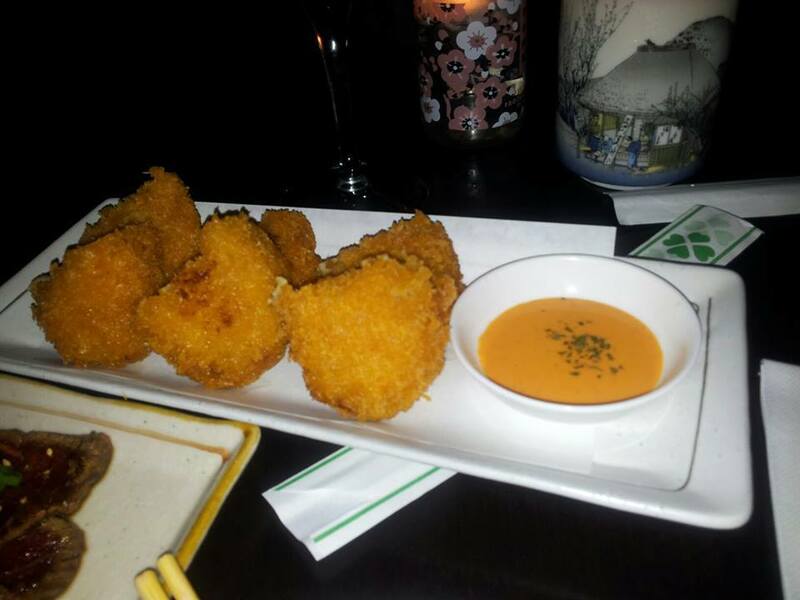 We commenced our sumptuous meal with the Crab Korokke, deep fried crab croquettes served with okonami sauce. The soft and crunchy outer layer of the croquettes breaks away to reveal a tantalising filling, to be savoured with the yummy okonami sauce. The Ebi (prawn) mayo is definitely worth a glowing mention. Tiger prawns are lightly deep fried, served with a creamy Japanese mayo and toasted thin almond slices. As I helped myself to a plump prawn, my tongue discovered a crunchy exterior giving way to succulent prawn meat. 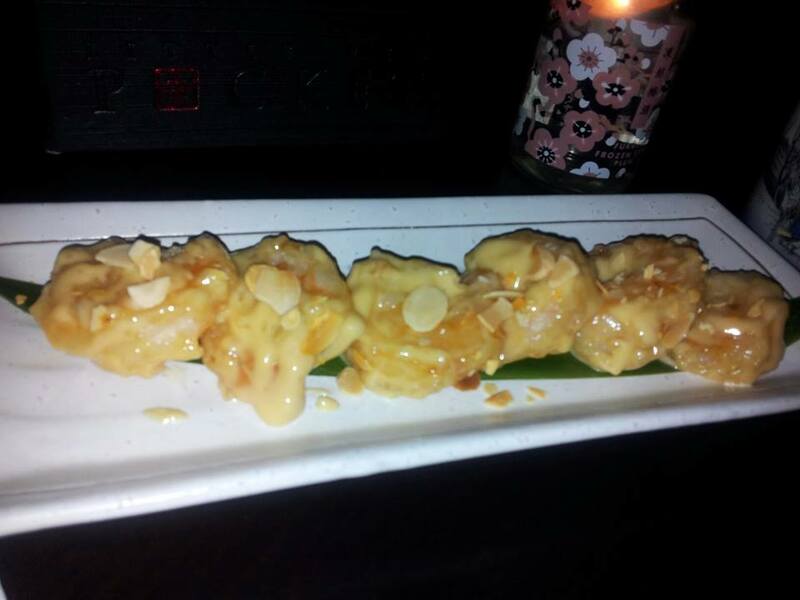 The Japanese mayo beautifully complimented the prawns while the almond slices intensified the sweet and sour flavour. I died and found myself in foodie heaven. Next came the Beef Tataki which is a serving of thinly sliced beef marinated with spring onion, ginger and garlic. 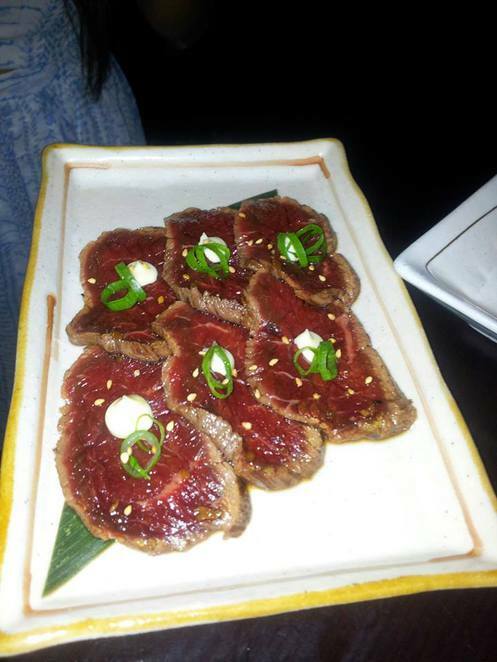 Served with a spicy soy sauce, the beef slices are surprisingly tender and light in the mouth. Wonderfully refreshing, this cold dish is another lovely creation of the Little Red Pocket. The Pork Kakuni (pork belly) was hands down the biggest highlight of our meal. Slices of pork marinated in sweet soy sauce and served in a skewer. Simple yet delightful, this dish scored 10 out of 10. Tender and juicy pork slices suffused with a hint of soy sauce, the meat disappeared into my mouth within seconds, as if by the wave of a magic wand. A melt in the mouth experience which leaves the tastebuds craving for more. All the items on the tapas menu are designed for sharing. Lizzie elaborated that the cocktails are created by expert bartenders and the food is prepared on the venue by highly skilled chefs, with the recipes unique to the venue. 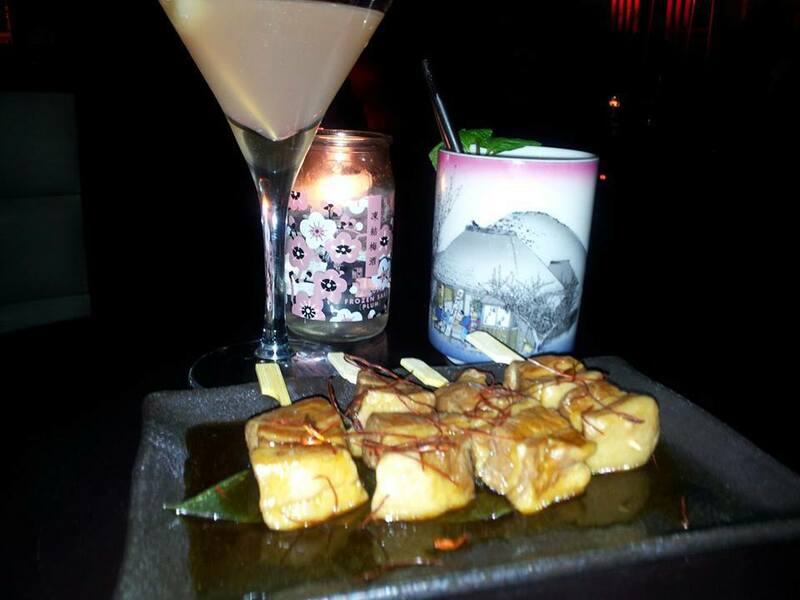 The Japanese inspired cocktails are highly recommended while the sakes are must-have items on the menu. Explore the comprehensive cocktails menu here and the sake menu here. Learn more about the Izakaya food menu by visiting this website. Little Red Pocket Cocktail is bestowed with a versatile and exquisite ambience. The environment is welcoming and the place is cosy. The service is friendly and attentive while the waitresses are always willing to aid you in your decision-making process. Loud Rnb music plays in the background lending the place a fun-filled setting. A fantastic location for having a glass or two with friends and colleagues or for celebrating a special day or event with a bunch of people, Little Red Pocket has you covered for both weekdays and weeknights and all sorts of celebrations. Weekly Friday night is a Cocktail affair which involves DJs playing old school Rnb beats that will see you grooving to the music as the night progresses. Friday evenings are further sweetened by the presence of a happy hour from 4pm to 8pm with $5 wine/beer/cider. On Saturday nights, Little Red Pocket transforms into the ultimate Rnb destination with live Rnb/Soul performers taking centre stage. 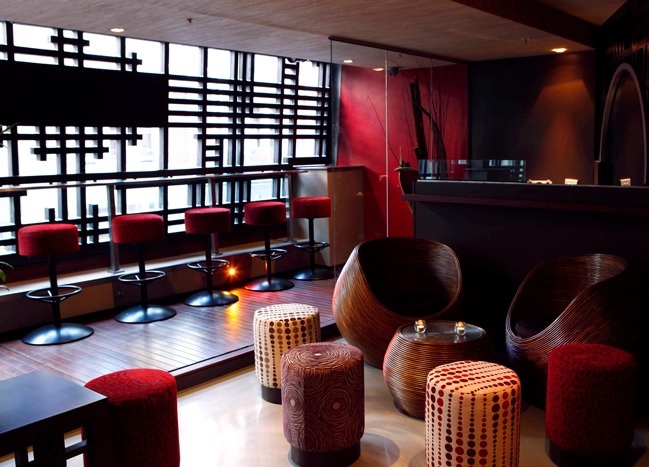 Little Red Pockets plays host to a diverse range of corporate and private functions and events including birthdays and networking events. 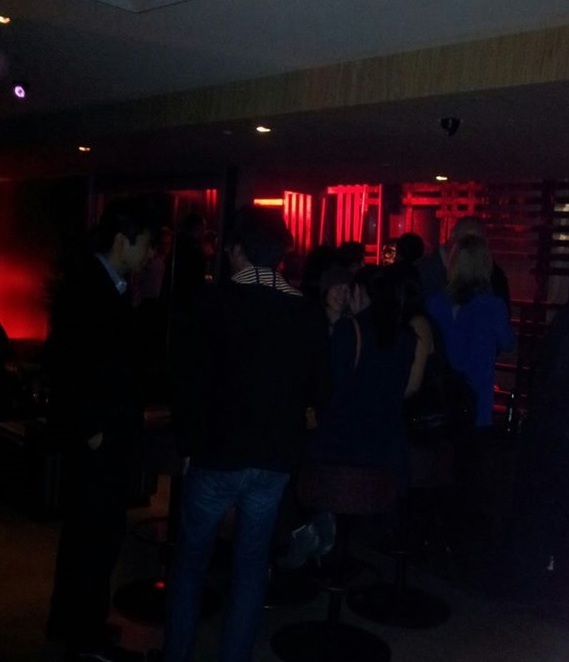 Private venue hire is available, accommodating up to 200 guests. Take your experience at the Little Red Pocket to the next level by registering for their free membership. Joining is easy and can be done by going here. You will also score a complimentary birthday gift on your birthday. Enter the enchanting world of Little Red Pocket by going here. Whether to catch a tasty bite or sample some sensational drinks with friends and colleagues or to celebrate a special event, Little Red Pocket Cocktail Bar will deliver a unique experience which will see you coming back for more. Went there thursday and saw an amazing guy (connorfrom AIM) performing around eighties. Wow! Extraordinary talent!!!! !